Dr. Francis wanted to see me in a month. She wants to make sure the stiffness in my left wrist and the inflammation in my right eye were just bumps in the road. My September appointment was on the 27th. One month away is very close to Halloween. There was a light bulb moment. I will come on Halloween. One of the nurses quipped, "Will you come in costume?" "Of course," I said. It was two days later that I realized exactly what I'd agree to do. Now I'm on a mission to make a Halloween costume that meets these criteria. Inexpensive. I am not spending $40 for a costume that I will wear once. I don't go to Halloween parties and, other than the doctor's office and work, I probably won't wear it again. Won't get me kicked out of the Outpatient area of the hospital. While bemuses stares and giggles are acceptable, having security called is not. Therefore, the suggestion of going as a witch is kind of out. I thought about going as Tim the Enchanter from Monty Python and the Holy Grail. I have the hat. It was a Christmas present from a friend one year. I could use a broom handle as a walking stick and making a long cloak out of black fabric wouldn't be that hard. There are patterns to make the knights' costumes from this movie so perhaps there is a pattern to make the cloak. So far, the suggestions have been to go as a teapot, a panda or a crayon. I've seen the crayon sewing patterns. While that is a fantastic idea, in the end, I think it will be too expensive. 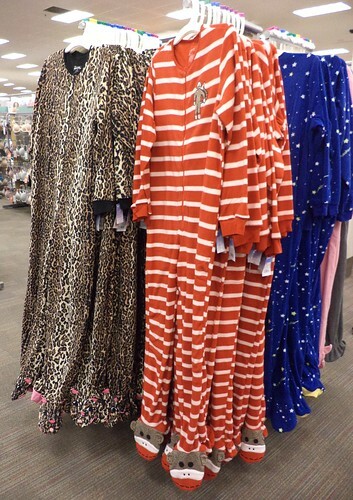 Then, I was in Target and walked by the lingerie department. Christmas gift ideas are out and they had a rack of these. I think there's potential here. OOOO Sock Monkey feet!! Awesome!! Whatever you go as, I expect to see a picture! BTW, I'm almost positive we have the same doctor since mine is Dr. Francis, too. Sure, there's the issue of us being on different coasts. A minor detail. Well, my Dr. Francis is available on Wednesday - Friday. She could see you on Monday and Tuesday and then fly to Chicago Tuesday night. It wouldn't be the weirdest commute I've ever heard of.